It´s a filmformat in 1.85 : 1 - exactly the same shape like 35mm widescreen. For 1perf or 2perf 16mm regular film. The filmgate is widened to both sides. The lens left centered and no other modifications are necessary. Ultra-16 has multiple sizes: R16, HDTV and Widescreen (see picture) and 2.35:1 cinemascope without anamorphotic lens. Ultra 16 is compatible with most R16 lenses! No new lenses! The original viewfinder with his optical marks was not designed to "see" the wider frame. Therefore, you have to compose the shots with this unmarked area on the right and left-hand side, and the slightly smaller vertical dimension in mind. This format allows also projections in regular 16mm or if your projection unit allows the widening of the filmgate without vignetting (projectors filmgate is normally a llittle bit smaller than cameras filmgate). TCO (total cost of ownership) is much lower than Super16: No new lenses, low modification and the total labor required - all cost is considerably lower. Ultra16 - 1.85 widescreen - HDTV - Regular16 - 2.35:1 Cinemascope / Techniscope telecine is possible with this format. There should be no problem for modern processing. Ask your lab for processing also Ultra16 format (between the sprocket holes is also exposure area). 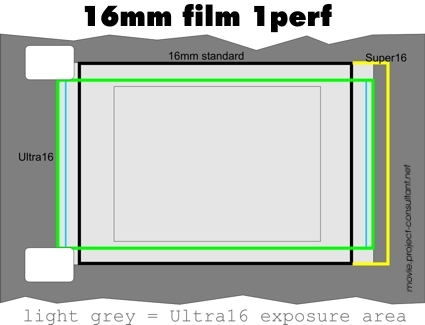 lightgrey shows the large exposure area of Ultra16 filmgate which covers also Regular16 !